We are an Independent Lift Company with many years experience in Lift Maintenance and Lift Repairs, our services are structured to cover the whole lifespan of your lifts, from lift installation, lift refurbishment and lift modernisation or repairs. We can take away the hassle and worries of your lift maintenance duties. Let us remind you when the lift requires a service or inspection. We’ll inform you of changes to legislation and regulations, report defects and make recommendations. Lift maintenance is our business and we have deep understanding built up over many years of experience, so choose use a company that provides the service that you actually want. All our Lift Engineers have vast experience and knowledge of lift servicing and repairs for all makes, types and ages of machine, including passenger lifts and goods lifts. This enables us to keep your lift working safely and efficiently, taking away the headache of employees, tenants, residents becoming frustrated at the lack of lift service. Our bespoke service guarantees the lift owner the correct level of Lift Maintenance ensuring customer satisfaction at all times. 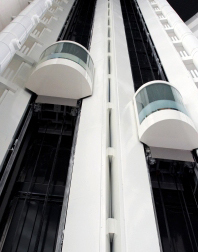 "We enlisted the services of JDR towards the end of 2009 after having become increasingly dissatisfied with the level of service experienced with our lift maintenance provider at that current time. To date, I have been very impressed by the service offered by JDR. John and his team of engineers are helpful, reliable and provide a far more professional service than that which we experienced for many years previously. I would wholeheartedly recommend JDR Lift Services and look forward to a long working relationship with them in the future."